A new workstation requires specific settings. See Shift4 i4Go V2 Requirements. Many of these errors occur because instructions were not followed properly or were skipped. Please take the time to read over the instructions and contact us if you don't understand them. Some errors seen here will refer to shift4test.com - this is only used in testing. Your actual URL will be i4go.com. One of the controls we use in the Shift4 interface isn't registered. Please run Register Programs and Controls from all computers after an update or when a new computer is installed. It must be run for each Windows user on that computer that needs to run the software. One of the dlls is having trouble because it hasn't been registered in the GAC. Please run Register Programs and Controls from all computers after an update or when a new computer is installed. It must be run for each Windows user on that computer that needs to run the software. This error occurs because you don't have the Microsoft DotNet Framework 2.0 installed, which is one of our basic system requirements. 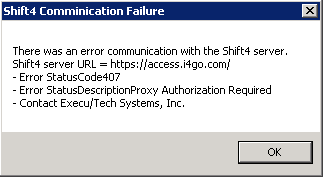 You'll see this error after swiping or entering card information in the i4Go V2 Card Entry Window. The URL will be different and will change from time to time but the cause of this error is the same. The URL can't be reached. We have no way of knowing why this is happening because the only information returned to us is that an HTTP timeout occurred. The most likely cause is a firewall. This error is caused by an incorrect version of Internet Explorer. The Microsoft component, ieframe.dll, is used to assist in communicating with Shift4 via HTTPS protocol. This file is updated with Internet Explorer and versions prior to IE 10 do not recognize some of the basic functions being used. Because of this, we are unable to retrieve the response from Shift4. This is covered in Steps 2 and 4 of Shift4 i4Go V2 Requirements - Make sure you can reach the URL from web browser as specified in step 4. This error occurs because your computer is unable to reach one of several URLs. The cause is either your internet or firewall. The error isn't that this window appears, it's that it remains for a while and then produces another error, often like the one after this error. 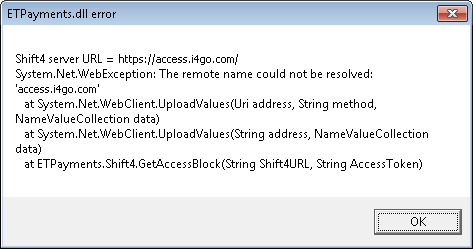 The interface isn't getting a response back from http://access.i4go.com but it also isn't getting an HTTP error. There are 3 common causes discussed below. A firewall is blocking outgoing traffic. You have a proxy server not allowing a connection. The error below is often seen right after this error. 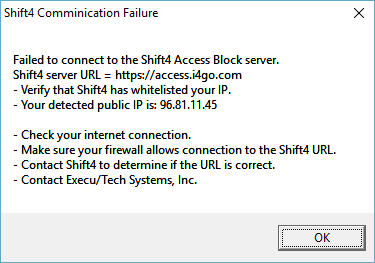 Failed to connect to the Shift4 Access Block server. - Verify that Shift4 has whitelisted your IP. - Make sure your firewall allows connection to the Shift4 URL. - Contact Shift4 to determine if the URL is correct. The Shift4 URL couldn't be reached. There were no errors, it just timed out. Maybe your IP Address isn't whitelisted or maybe you have a firewall blocking access. There was an error communicating with the Shift4 server. The interface MUST be able to reach https://access.i4go.com. It seems you're using a proxy server and it isn't allowing the connection. 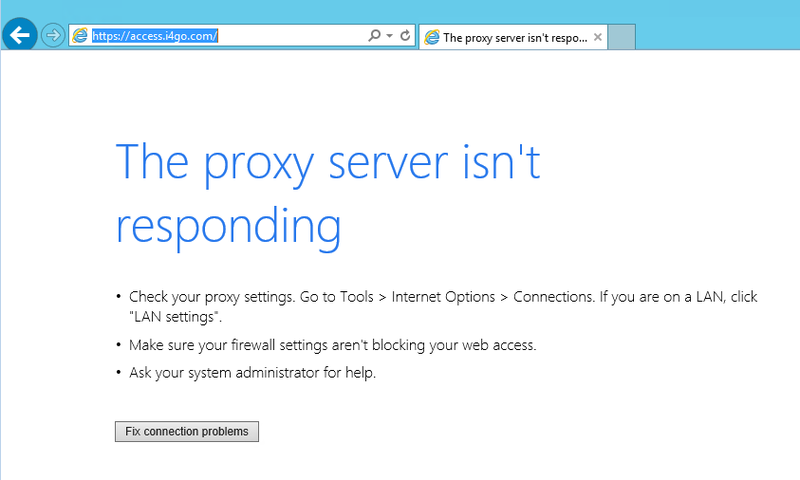 If using a proxy server, the interface must be able to reach the URL with the windows user credentials. 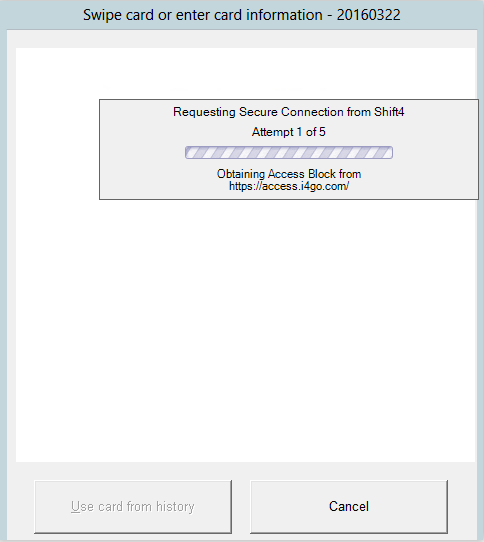 The interface MUST be able to reach https://access.i4go.com from every terminal that needs to process credit cards. It seems you're using a proxy server and it isn't allowing the connection. If you can't access the URL via Internet Explorer from the terminal having the problem, the interface likely won't be able to either since it utilizes the Internet Explorer component ieframe.dll to assist in communicating. This error is seen before you enter card information and the "Error:" usually states that something is undefined. 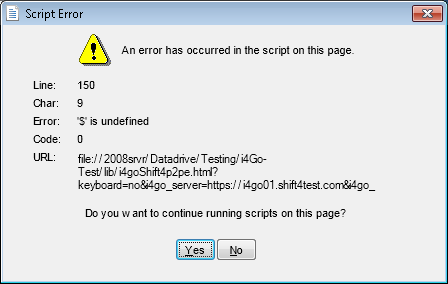 This error is typically caused by missing files in the "lib" folder within the software folder. Contact Execu/Tech support and we will verify that all files are there and that none have been corrupted. Invalid data was returned. Maybe it's your card swipe - configure it to send all tracks on a single line. Consult the manufacturer for instructions. This error is seen after you swipe a card using an unencrypted card reader. If you click OK, you will likely see the next error. The card may still process since the error occurs after the initial track is submitted. Your card reader is likely sending a Carriage Return after each track. We attempt to trap this but all devices are different and sometimes it gets through. 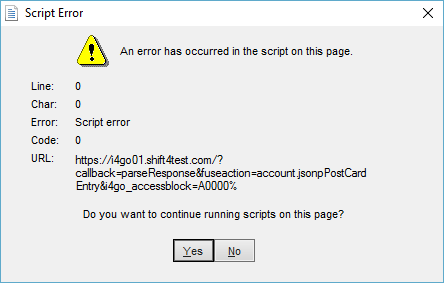 The error is caused by another form submission while the current one is still in progress. If you have a MagTek card reader, use these instructions to remove the extra Carriage Return. This error is seen after you swipe a card using an unencrypted card reader. "Line:", "Char:" and "Code:" are usually "0". If you click "Yes" the card may still process since the error occurs after the initial track is submitted. 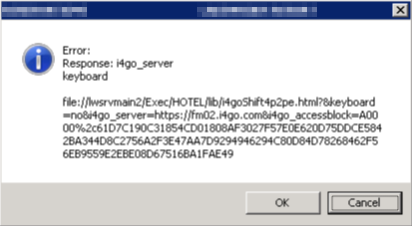 This error is often the result of an incorrect Access Token, a critical piece of the authentication process. Please contact Execu/Tech support and we'll help you verify the Access Token. You may have to obtain a new Access Token from Shift4 for each merchant having a problem. This error could also be the result of a firewall blocking traffic to URLs used to verify your external IP. The key here is the word "null". 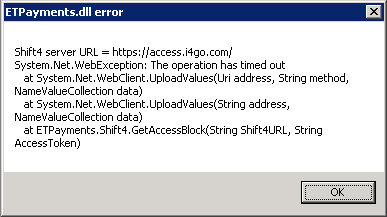 While initiating communication with Shift4, something went wrong and we didn't get the i4GoV2 server URL. Try again. These errors are seen before you swipe a card. Both are typically seen at the same time. The problem is that your operating system is unable to load a progress bar image into memory. It's corrupted in memory or just not loaded at all. The easiest solution is an update to the Shift4 interface. We've removed this image and replaced it with a code generated progress bar, rather than the Microsoft .Net progress bar, which relies on an image. If you don't want an update, your only solution is to reload your operating system and possibly replace the RAM in your computer. We recommend that you get an update to the Shift4 interface. Contact us and we can schedule it for you. System.Security.AuthenticationException: The remote certificate is invalid according to the validation procedure. This error happens because the SSL certificate stored for the specified URL was never installed or is no longer valid.For most customers a new SSL will automatically be updated. In some cases, however, either due to security settings or an outdated operating system, the certificate will not update. Please follow the SSL Certificate instructions in step 5 here Shift4 i4Go V2 Requirements. 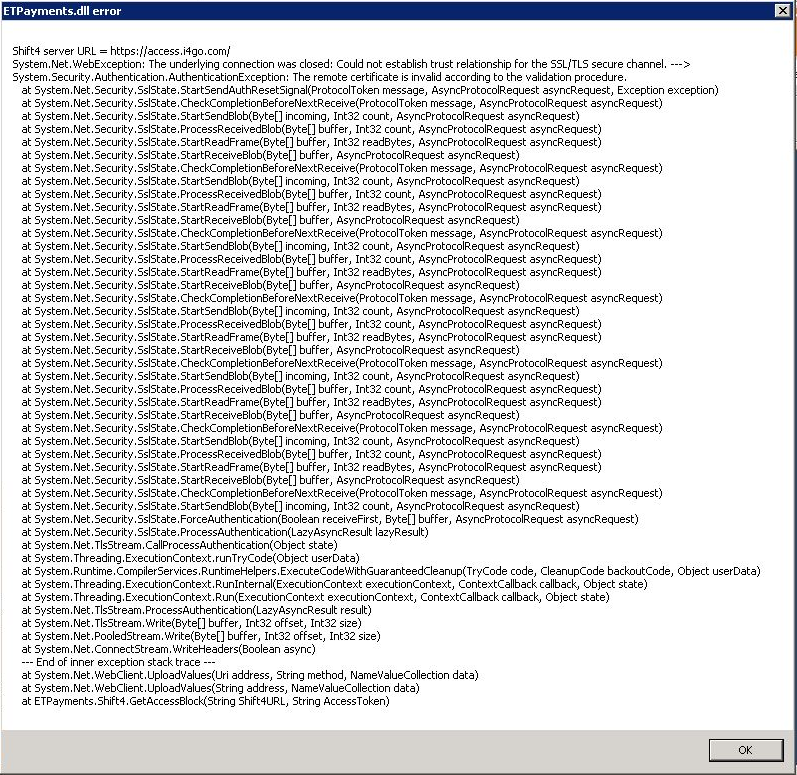 System.Net.WebException: The underlying connection was closed: An unexpected error occurred on a send. ---> System.IO.IOException: Unable to read data from the transport connection: An existing connection was forcibly closed by the remote host. You may begin seeing this error beginning in June 2018. You are seeing this error because your computer is not compatible with TLS 1.2.